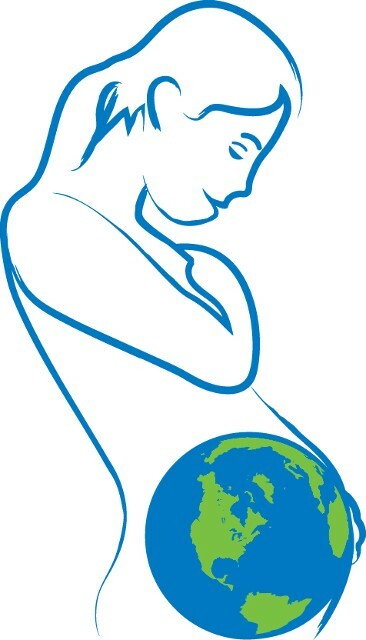 It's not too late - The Earth can be Reborn! EFD Provides resources to the community that strenthen local food security, advance women's economic security, and conserve the natural environment. What is the Community Garden Start-Up Kit? 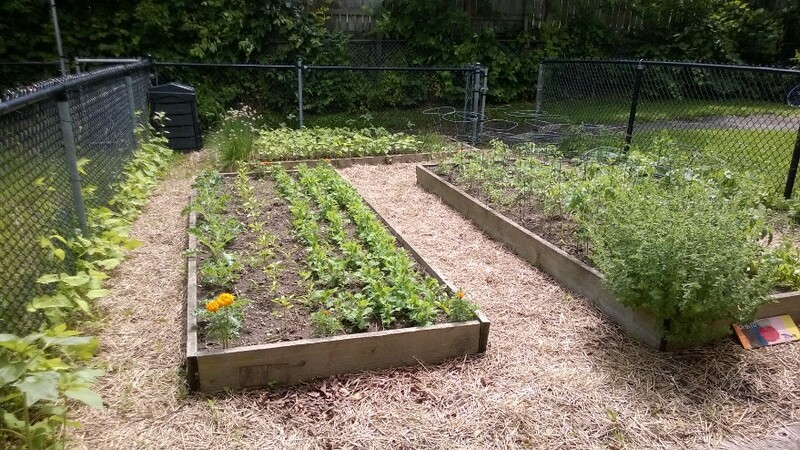 Community Garden Start-up Kit - Each year, Earthmama Farms grows a variety of herb and vegetable plants and orders a bulk shipment of seeds thanks to the generous support of Hawthorn Farm, a local, Southwestern Ontario grower of quality organic seed. With the Community Garden Start-Up Kit, Our volunteers offer assistance to schools or community groups looking to start classroom or community gardens in return for a donation* to our long term goals. -A Preliminary Visit where we will walk around the garden space with our clients to help envision what kinds of things they'd like to grow. We also talk about access to water and potential rainwater harvest, composting, soil quality and soil health, sun exposure, etc. We'll make suggestions as to which varieties will do well in the space and discuss the size and style of the garden, whether it is to be raised box beds or pots or something larger. Together, we will design a Site Plan for the garden. -A Work Day where EFD volunteers will work with the client to implement the Site Plan to establish the garden. -Once the garden is planted we then notify you of any threats like Fost Risk evenings and tell you what to do to protect your crop. We will also update you throughout the summer on things like Early Tomato Blight and what to do about this and other hazards to your yield. We are also on hand to answer questions such as when to harvest which varieties. -When Fall comes around we can answer questions on how to plant a cover crop to keep your soil protected from the elements and provide much needed nutrients back into your plots, helping to ensure a greener harvest for next year. *please note - recommended donation amount is negotiable and varies based on the amount of work, plants, seeds, materials and visits involved and will be determined at the preliminary visit. 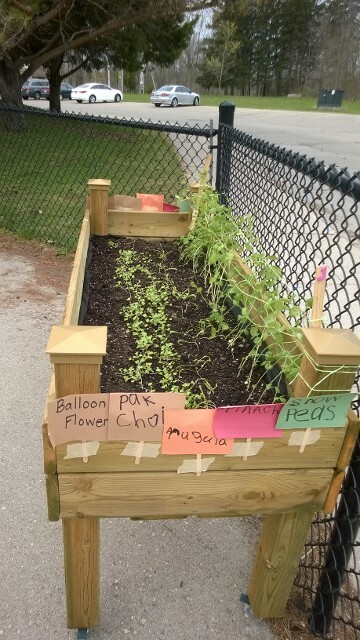 After just two weeks, our friends in Mrs. L'Heureux's FDK at Monsignor Morrison in St. Thomas Ontario are seeing some great results in the classroom garden that we helped them strategize and plant. 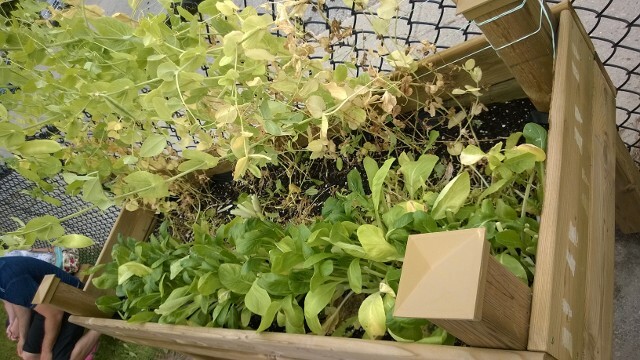 The plants include sweet snow peas, spinach, greens and perennial flowers and are growing beautifully in an interactive learning centre in the FDK classroom. These versatile plant boxes can be wheeled outside when the weather warms up, making them a very practical interactive learning feature for the classroom. Great Job! At our second visit to Mrs. L'Heureux's class, we brought strawberry plants and green bean seeds. 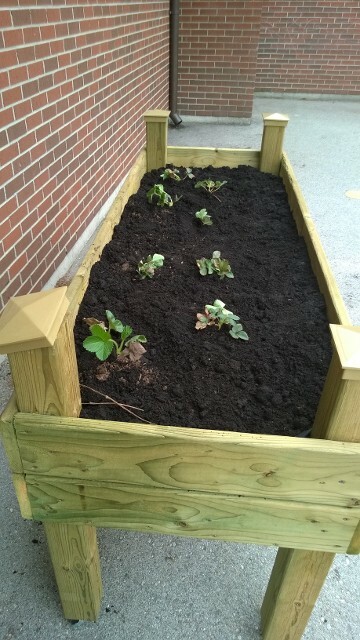 We had the kids line up to plant a seed apiece and then we planted the strawberry plants. 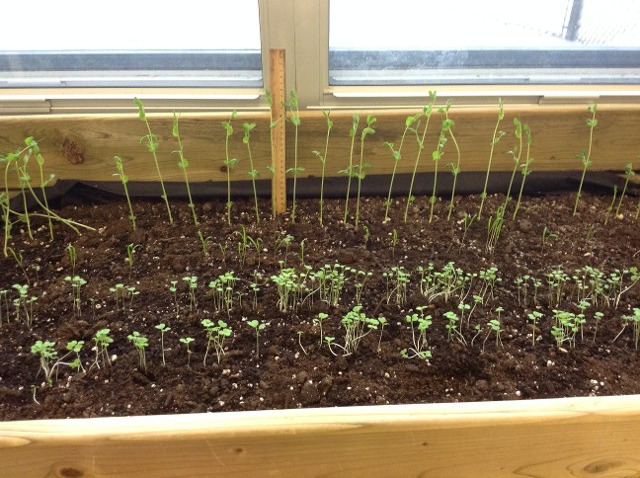 Their snow peas and salad greens were making progress! 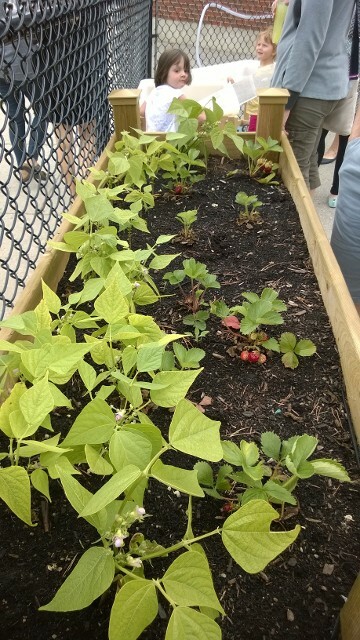 At the third visit, which was part of the end of year celebration festivities honouring Mrs. L'Heureux's amazing outdoor classroom, we saw that the beans and strawberries were doing amazing! 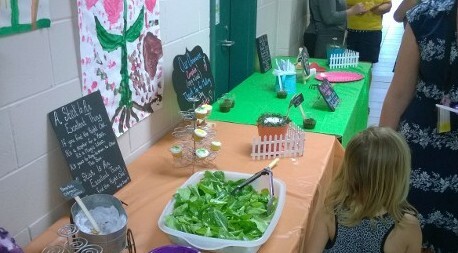 There was ripe fruit on the plants, and Mrs. L'Heureux assured me that each child had been able to taste the berries. 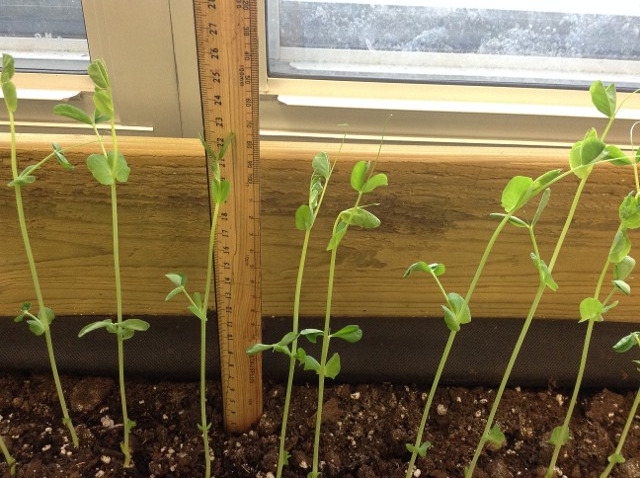 The class had harvested their salad greens and snow peas . . .
And put them into a tasty salad for everyone to enjoy! Earthmama founder Heather Derks brought some perennial flowers and plants for the outdoor classroom, which she helped them plant during the ceremony. 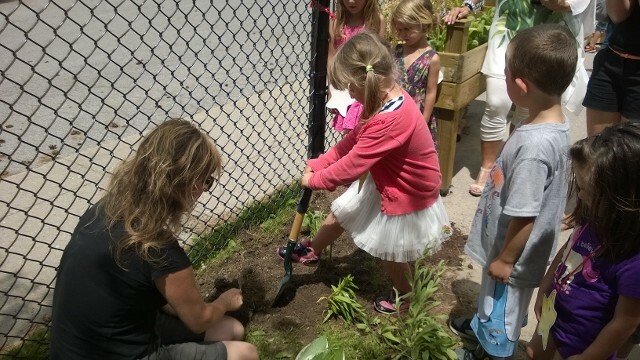 The perennials, including hostas, gallardia, asiatic lilies, sage, and winter-hardy hisbiscus, will come up in the spring each year, giving the children of future classes an exciting new learning centre to observe the natural world at work. The flowers will also help attract pollinators to the outdoor garden! In keeping with this goal, we are now recruiting for our Business Advisory Panel, a group of volunteers with relevant knowledge that will act as advisors towards our project. To get involved, (or if you represent a food-service business that might be interested in becoming our pilot customer) please send us a message via our 'Contact' page or phone our office at 226-653-0058.